Two women gaze out at the viewer—to the right, a sepia colonial portrait of an African woman is cast onto the wall; to the left, Makhubu. She stands behind a projection of a boy with vitiligo, a condition that bleaches skin pigment, alluding to the “whitening” of Africa both under colonial rule and in a globalizing modern world. 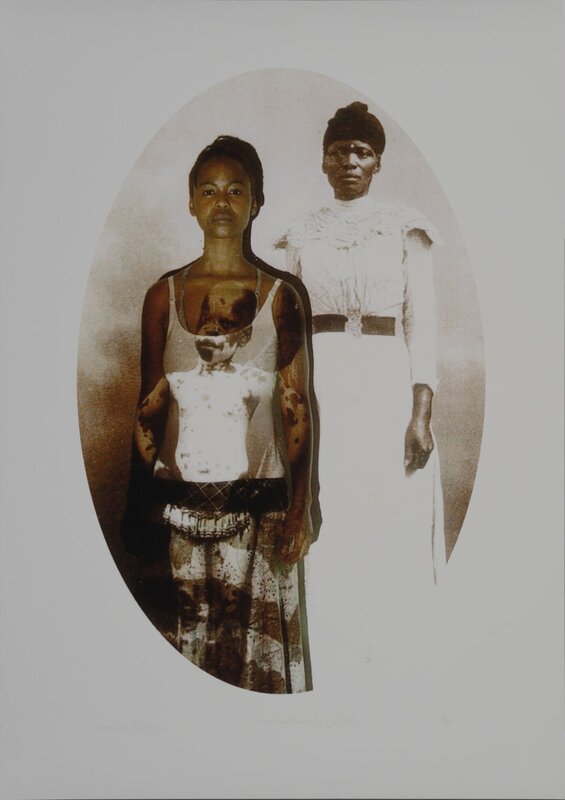 These self-portrait photographs from The Self Portrait Project, which project colonial photographs of African woman over Makhubu’s body, physically and culturally situate her in the sociocultural history of black womanhood. By placing herself side by side with this woman, Makhubu compares their experiences of African femininity. Though separated by a century, both women face discrimination, the obliteration of local culture, and a mutual female experience. One exists in in a colonized Africa where portraiture is a documentary, ethnographic tool, the other resides in postcolonial Africa and continues to deal with the remnants of colonialism and the loss of local culture in the face of globalization.